0 Comments Published by KL Ocs Kid on at 8:02 AM. 0 Comments Published by KL Ocs Kid on at 7:09 AM. JJB Stadium Saturday, 29 September Kick-off: 1500 BST Coverage on the BBC Sport website, BBC Radio Five Live & highlights on Match of the Day. Featured game on Score and Final Score. Liverpool boss Rafael Benitez must decide whether to retain Carling Cup hat-trick hero Fernando Torres. Jermaine Pennant and Javier Mascherano return from injury, while Benitez has no new problems to contend with. Wigan have concerns over Kevin Kilbane (ankle), Ryan Taylor (calf) and Antonio Valencia (hamstring). But Paul Scharner and Andreas Granqvist, who sustained injuries in last week's 2-1 defeat at Reading, should be fit to play. Wigan (from): Kirkland, Melchiot, Granqvist, Bramble, Kilbane, Brown, Scharner, Skoko, Koumas, Sibierski, Bent, Aghahowa, Boyce, Cotterill, Hall, Olembe, Taylor, Valencia, Pollitt. Liverpool (from): Reina, Finnan, Hyypia, Carragher, Arbeloa, Aurelio, Riise, Pennant, Gerrard, Sissoko, Mascherano, Benayoun, Babel, Kuyt, Crouch, Voronin, Torres, Itandje. Wigan manager Chris Hutchings on Liverpool's squad rotation: "It doesn't matter who he plays - (Dirk) Kuyt, (Peter) Crouch - he's a number of fantastic players, and whoever is on the teamsheet we have to deal with them. "It's a nice decision for him to have to make, but only he can decide. With important games coming up, if that's his choice to keep everybody fresh, then that's what he'll do. The players have to accept it, adapt to it and get on with it. "You don't quite know what you're going to get from them. On any given day they can knock four or five past you, while on another day they might struggle - for our sake, let's hope they struggle." Liverpool boss Rafael Benitez on Fernando Torres, who scored a hat-trick against Reading in midweek: "I don't know if Torres will start against Wigan. I need to decide because I know my players and watch every training session. "We signed Torres because we knew about his quality and we bought Kuyt and Voronin and Crouch. Everybody is talking about Torres because he scored three goals but as a manager you have to make the decisions. "You need to protect key players. It is important that if you want to see better football you need to protect the players with quality then we'll see more goals and maybe people will be happier." Liverpool go into this game as one of two clubs still holding an unbeaten Premier League record, but four points behind Arsenal at the top of the table. Wigan are the lowest placed of the eight clubs still unbeaten at home in the Premier League. The last two of the Merseysiders' Premier League games have been goalless; Wigan have only recorded two no score draws in their 84 fixtures in this league. Liverpool have conceded more penalty kicks in Premier League competition than any other club this season (three); Wigan have converted all three they've been awarded - no club has scored more so far this term. Liverpool hold a perfect Premier League record over Wigan of four wins from four matches with 10 goals scored and none conceded. 1. Not won in five league and cup games. Drawn two and lost three since beating Sunderland 3-0 at home on 18 August. 2. Seeking a first victory in five Premier League matches. They've gained two points from the last available 12. 3. Need a win to total 100 Premier League points in their history. 4. Lost 2-1 at Reading last Saturday, but not suffered successive defeats in eight Premier League games since losing three in a row on 5 May. That sequence started with a 2-0 defeat at Anfield. 5. Hold the tightest defence in the bottom half; just seven goals shipped. 6. One of two clubs who've scored just one goal in the first half of Premier League games; the other is Aston Villa. 7. Their only points from their last eight north-west Premier League derbies was from a 0-1 away win over Manchester City on 3 March. 8. Currently on eight points after seven games. In the two previous seasons in this league they had 13 and five points at this identical stage. 9. Picked up seven points from the nine available at home this season, and three goals short of totalling 50 in the Premier League at the JJB. 10. This is the first of two tough fixtures. A visit to the Theatre of Dreams to face Manchester United follows this. 1. Undefeated in 10 games this season; won six and drawn four. 2. Dropped just six points - bettered only by Arsenal, who have claimed all but two of the points available to them. 3. One of four clubs who've got double figures in the "Goals For" column in the Premier League table. The others are Arsenal, Fulham and Tottenham. 4. Registered two goalless draws in Premier League matches this season - more than any other club; and not scored in 194 minutes (three hours 14 minutes) since Andriy Voronin wrapped up their 6-0 home win over Derby on 1 September. 5. Not conceded in four games, or 434 minutes (seven hours 14 minutes) of Premier League football since Frank Lampard netted for Chelsea at the Bridge on 19 August. 6. The Premier League's joint meanest defence with Manchester United. Both clubs have leaked just two goals. 7. An opponent is yet to score the opening goal in a Premier League game against them this season, or indeed net from open play against them. 8. The only club yet to concede in the first half of the Premier League. 9. Picked up seven points from the nine available on the road; that's more than any other club away from home in the Premier League. 10. This match precedes Wednesday's Champions League Group A fixture, home to Marseilles. Antoine SIBIERSKI is Wigan's leading scorer with three Premier League goals. Chris KIRLAND will be facing a former club. The 26 year old keeper made 45 appearances (25 in the league) for Liverpool between August 2001 and his move to Wigan in July 2006. Kevin KILBANE will be making his 250th career Premier League appearance (Sunderland, Everton and Wigan). Jason KOUMAS will be making his 50th Premier League appearance (West Brom and Wigan). 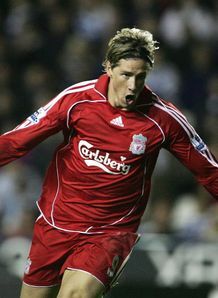 Midweek hat-trick hero, Fernando TORRES is Liverpool's top scorer with six goals, and top Premier League marksman, with three. Dirk KUYT scored three goals in the two games against Wigan last season. Liverpool were rampant in this fixture last season when Craig Bellamy scored half of their four unanswered goals. Wigan have lost all six games they've played against Liverpool in the Premier League and League Cup, and have only scored two League Cup goals against them, conceding 18 goals in total. Steve Bennett was originally scheduled to control this match, but he has been swapped with Mark Clattenburg, who is now in charge of the Birmingham v Manchester United match. 0 Comments Published by KL Ocs Kid on at 7:06 AM. EXCITED youngsters fired questions at Liverpool FC captain Steven Gerrard yesterday as he visited a Liverpool charity to talk about healthy eating. The star midfielder visited KIND, a charity for disadvantaged youngsters, at its base on Back Canning Street, to talk to a group of children about lifestyle and how to stay healthy. He signed the children’s shirts, answered their questions, and offered advice to aspiring football stars. Most of the children were more interested in his millionaire lifestyle than his health, and questions about fruit and veg soon turned to how much he earned in a week, whether his wife Alex could cook and if a black Bentley parked outside was his. When asked how he would have responded to somebody telling him what to eat when he was a child, Gerrard said: “It would depend who it was. If it was my mum and dad, I would probably argue; if it was John Barnes or Gazza, one of my heroes, I would follow because that was who I wanted to be, and that is the point of my visit really. The visit was arranged as part of an initiative by the Premier League to involve clubs in their local communities. One Liverpool fan, 11-year-old Joseph Adebetun, from Toxteth, could not believe he was meeting his idol. Liverpool captain Steven Gerrard believes he is only now getting back to his best following his recent troubles with a fractured toe. Gerrard picked up the injury during a Champions League qualifier against Toulouse five weeks ago and played through the pain barrier in two Euro 2008 qualifiers for England earlier this month. Liverpool boss Rafael Benitez has started his skipper on the bench in two of the last four games and Gerrard claims he is beginning to feel the benefit of the patient approach. "I'm feeling a lot better now," he told the club's official website. "The last three or four days, I've been totally pain-free from my toe. "I've struggled during the last two or three games and have been getting a lot of pain from it. "But I've been training every session and can feel my sharpness coming back, so I think my top form is only around the corner. 0 Comments Published by KL Ocs Kid on at 6:58 AM. Test yourself against the best. Join The World Game tipping competition now. New Marseille coach Eric Gerets is aiming to cause "a little surprise" when he oversees his first game - at Liverpool in the Champions League on Thursday (AEST). The Belgian succeeded Albert Emon at the helm earlier this week and is hoping his new team play as well at Anfield as his old team did on his last visit to Merseyside. He told www.om.net: "My last match with Galatasaray was against Liverpool." "In England, we played a good match. Liverpool were too strong in the first half and led 3-0, but we came back strongly to 3-2 and even had two chances to equalise. But we didn't. I hope OM will play as well as Galatasaray did. "We'll try to prepare as professionally as possible in order to create a little surprise in England." 0 Comments Published by KL Ocs Kid on Friday, September 28, 2007 at 12:12 PM. It keeps every player hungry. You don't want to be out of the side, so you've got to perform when given the chance. The players who came in have done that. Peter Crouch has told Liverpool's hat-trick hero Fernando Torres that there is no avoiding Rafael Benitez's rotation policy. The Spain international, left on the bench for the Premier League stalemates against Portsmouth and Birmingham, started against Reading in the Carling Cup and hit a superb second-half treble as the Reds progressed 4-2. But Benitez has already warned Torres there are no guarantees he will start against Wigan this weekend, a situation Crouch is all-too aware of. The England striker said: "It is certainly something he'll have to get used to. The manager likes to chop and change the team but as long as it works and we play like we did at Reading, then I'm sure there won't be too many people complaining. "It keeps every player hungry. You don't want to be out of the side, so you've got to perform when given the chance. The players who came in have done that." Crouch started alongside club-record signing Torres at the Madejski Stadium and insists there is more to his game than just goals. He said: "The thing about Fernando is that he's a top class player but he works so hard for the team. You can see that. The manager obviously likes all the players to work hard and the strikers to track back and he does that extremely well, as well as his more obvious qualities. "His goals were fantastically taken and it was a superb all round performance. "He's a strong lad and he proved that he can certainly cope with the physical side. He comes from a different way of playing - Spanish football is different to English football - but he's an extremely strong physical player. He has pace and attributes to help him cope with that. I'm sure he's going to be a force this year." Meanwhile, Crouch has admitted he has had to change his style of play for international action and in the UEFA Champions League. Former referee Graham Poll claimed Fifa instructed World Cup officials to focus on the giant striker at last summer's tournament in Germany. Crouch told Radio Five Live: "Certainly, in the Champions League and in international football, I feel like I've been penalised far too much, whereas in the Premier League I haven't been penalised for things. "I've had to adapt my game in internationals and the Champions League. I feel the way I play is within the rules of the game. I'd like to find out from the governing body if I was targeted." 0 Comments Published by KL Ocs Kid on Thursday, September 27, 2007 at 8:25 AM. STEVEN GERRARD watched Fernando Torres celebrate his first Liverpool hat-trick last night . . . then compared the Spanish striker with one of the greatest Anfield legends of all-time. Torres struck three times in Liverpool’s 4-2 Carling Cup triumph at Reading, and afterwards the Reds skipper delivered the most glowing tribute imaginable when he declared: “He reminds me of Ian Rush. “I know Ian Rush was a great striker and as captain I don’t want to put too much pressure on him in terms of goals. “But Rushie got a lot of credit for working hard for the team, tracking back and not giving defenders a minute on the ball. “And that’s what Fernando does. Gerrard, who played the through ball for Torres’ hat-trick goal, was also delighted by Torres’ attitude. “Foreign strikers usually go hiding when they get a bit of stick, but he got murdered all night and kept coming back and coming back,” he added. ”His goals were great, but the best thing about him was his attitude. Despite Torres’ treble, however, boss Rafa Benitez insisted he couldn’t guarantee the striker a starting place at Wigan on Saturday. “I can’t guarantee anything,” he explained “because I like to see my strikers during the week before I make a decision. Benitez insisted he had been right to leave Torres out against Birmingham three days earlier. “He was really dangerous tonight because he had space,” he added. “It was a different game the other day. “I think about my team and our supporters are clever. They know I am doing the best for my team. 0 Comments Published by KL Ocs Kid on at 8:24 AM. Our columnist Alex has been looking at how Liverpool have done in the league or cup AFTER a Champions League game and BEFORE, with a view to how it has affected our league form and if we tend to lose after a Champions League game. Home P19 W11 D5 L3 Away P21 W4 D4 L13 I've excluded the games after the Champions League finals as these weren't played until the following season. I also extracted the multiple consecutive Champions League results where we had to play all qualifying rounds in order to defend our title. So Liverpool have lost a lot of away games after a Champions League fixture and not so many at home. 25 away defeats in 80 games is 31.25% compared to Rafa's overall 46 defeats in 187 games which is 24.60%. We are more likely to win at home and lose away anyway, although the number of away defeats after a Champions League game is worrying. The teams we lost away to after a Champions League game were: 0-1 Bolton 1-2 Man Utd 0-1 Chelsea 0-1 Everton 2-3 Chelsea (League Cup Final*) 0-1 Man City 1-3 Arsenal ------------- 0-2 Fulham 1-2 Arsenal ------------- 0-1 Chelsea 0-2 Bolton 0-2 Man Utd 1-2 Portsmouth *technically the final is on neutral ground, but it is away from Anfield and it's not worth extracting one-offs on neutral ground. So after a Champions League match we've lost away at Man Utd twice, Chelsea three times, Arsenal twice and Bolton twice. Either we have really bad luck or the fixtures are fiddled to give us nasty away games in weeks known to have Champions League fixtures. The divides indicate different seasons, no wonder we lost so many away games in Rafa's first season, 11 league games, when these were so often tough games played after a Champions League match. 0 Comments Published by KL Ocs Kid on at 8:23 AM. 0 Comments Published by KL Ocs Kid on at 8:21 AM. Fernando Torres walked off the pitch at the Madejski Stadium last night with the match ball under his arm, the hat-trick that knocked Reading out of the Carling Cup an eloquent response to his manager's decision to leave him out of the starting XI for Liverpool's last two Premiership matches. 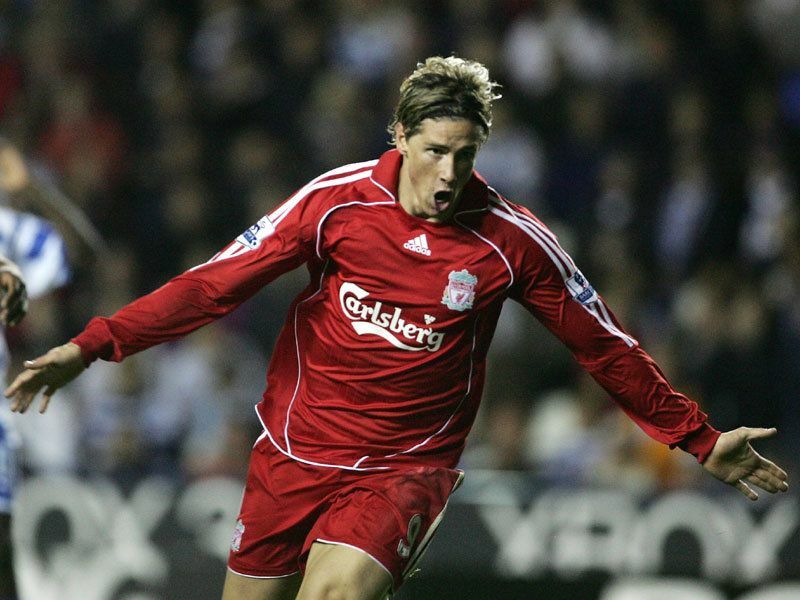 Torres doubled his tally of goals in a Liverpool shirt in 36 second-half minutes to underline the predatory skills that persuaded Rafa Benitez to part with £20 million for his services in the summer. "He shows he can kill defenders," Benitez said after the game. "The difference was obviously £20?million," his opposite number, Steve Coppell, said ruefully. "You want to play against the best players and you make your reputation by stopping these players. He gained confidence with each goal and became more expressive." Even so, Torres is not certain of making the starting XI at Wigan on Saturday. "Nothing is guaranteed, nothing," Benitez said. "I have to do the best for my team," adding that the confused young Spaniard could play "if he's not injured and continues to train well". Asked why Torres was not an automatic selection – he has started just six of his nine games for Liverpool – Benitez said enigmatically: "It's about space." When he elaborated, the manager suggested that there were teams, like Portsmouth and Birmingham in recent weeks, who would not allow him the sort of space afforded last night. Coppell was asked if Torres would have a regular place in Reading's team. "It would be nice to have the problem," he said. Coppell felt Torres had been pretty anonymous in the first half; it took him less than five minutes of the second to put his seal on the third-round tie, putting Liverpool ahead for the second time. Andre Bikey lost the ball to Yossi Benayoun near the halfway line, and it was quickly transferred forward where Torres had stolen a crucial half-yard on Michael Duberry before slotting home from 15 yards. His second, after Reading had equalised again, came courtesy of substitute John Arne Riise, who twisted inside Ulises de la Cruz on the dead-ball line, cutting the ball back for Torres to sweep into the net. The one that won him ownership of the match ball came four minutes from time, Steven Gerrard's ball through a disintegrating defence allowed him to round Adam Federici and roll it into an empty net. Bikey seemed to have his measure in the first 45 minutes, some of his challenges rough and ready, but could not get near him in the second. Benayoun had set the ball rolling midway through the first half, pouncing on Bikey's half-cleared header, and he might have finished the game off in the final minutes, but shot too close to Federici. Bobby Convey equalised with a volley from just inside the area, after Momo Sissoko put John Halls' corner straight to him. There was more than a suggestion of offside about that goal, and again for Halls' second equaliser, at the second attempt after Charles Itandje flapped at Nicky Shorey's corner. However, the evening was all about Torres. "He is going to set the game alight in this division," Coppell said. But only if he is given the opportunity. Reading (4-4-2): Federici; De la Cruz, Bikey, Duberry, Shorey; Halls (Hunt 80), Harper, Fae, Convey (Kitson 80); Lita, Long (Henry 80). Subs: Hahnemann (g), Cisse. Booked: Bikey, Duberry, Fae. Liverpool (4-4-2): Itandje; Finnan, Arbeloa, Carragher, Aurelio (Riise 69); Benayoun, Sissoko, Leiva (Hobbs 90), Leto; Crouch (Gerrard 77), Torres. Subs: Martin (g), Putterill. Booked: Leiva. Referee: M Atkinson (West Yorkshire). 0 Comments Published by KL Ocs Kid on at 8:18 AM. Fernando Torres, rested to the bench in Liverpool's last two Premiership games, made the most of a rare start under Rafael Benitez's rotation to score a hat-trick of true striker's goals and hand Liverpool victory in an entertaining cup tie. Yossi Benayoun had given Liverpool a lead after a wonderful solo goal, beating a man on the edge of the area and then picking his spot from 15 yards. But Reading were soon back on level terms thanks to a disputed Bobby Convey volley with a pair of Reading players in clear offside positions and blocking Charles Itandje's line of vision. After the break Torres showed power and pace to leave the Reading defence standing and passed his shot into the bottom left hand corner of the goal. Arsenal gave youth its chance against Newcastle at the Emirates Stadium and once more Arsene Wenger's young guns produced the goods. Young Dane Nicklas Bendtner scored the important first goal of the match when it had looked likely to go in to extra-time. Bendtner met a perfect cross from Armand Traore with a powerful header to break the deadlock. Minutes later Denilson registered his first goal for the club - a thunderous drive after being fed in by Abou Diaby. Lukasz Fabianski started in goal, while Lassana Diarra, Brazilian teenager Denilson and Theo Walcott also made the side. Emmanuel Eboue returned from an ankle problem, with Philippe Senderos named captain. Newcastle were without Michael Owen, who is reported to be out of the forthcoming England Euro 2008 qualifiers because of a groin problem. And Sam Allardyce's side missed his goal threat as they rarely put pressure on a resilient if callow Arsenal back line. Georgios Samaras, not even previously offered a place on the bench by Sven-Goran Eriksson so far this season, slotted home a last-gasp winner to send Manchester City through and impress either his manager of potential suitors come January. The Greek forward finished off Kelvin Etuhu's superb through ball to ensure City overcame a determined Norwich side who scrapped throughout but never really looked like causing a shock. City themselves produced little with only a handful of half chances before Samaras made the decisive intervention. Etuhu, on as a substitute, wasted an opportunity to mark his debut with a winner of his own, while Rolando Bianchi was also off target with a snap-shot as the clock ticked down. But, with the game heading to extra-time, Etuhu produced the pin-point pass which allowed Samaras to send City into the last 16. Kevin Nugent scored a welcome goal for Portsmouth at Turf Moor after enduring a difficult time since his £6million summer move from Preston. Nugent's 69th minute strike past Burnley keeper Gabor Kiraly was only his second goal since arriving at Fratton Park and drew furious protests from the home side, who claimed the striker had handled Pedro Mendes' cross before firing home. But that will not matter to Nugent, who had wasted a better opportunity earlier in the game when one-on-one with Kiraly. But Nugent struck back with a fine low finish to maintain Pompey's interest in a competition which, having made 10 changes from the win at Blackburn 48 hours earlier, is clearly low on Redknapp's priority list. 0 Comments Published by KL Ocs Kid on Tuesday, September 25, 2007 at 3:36 PM. 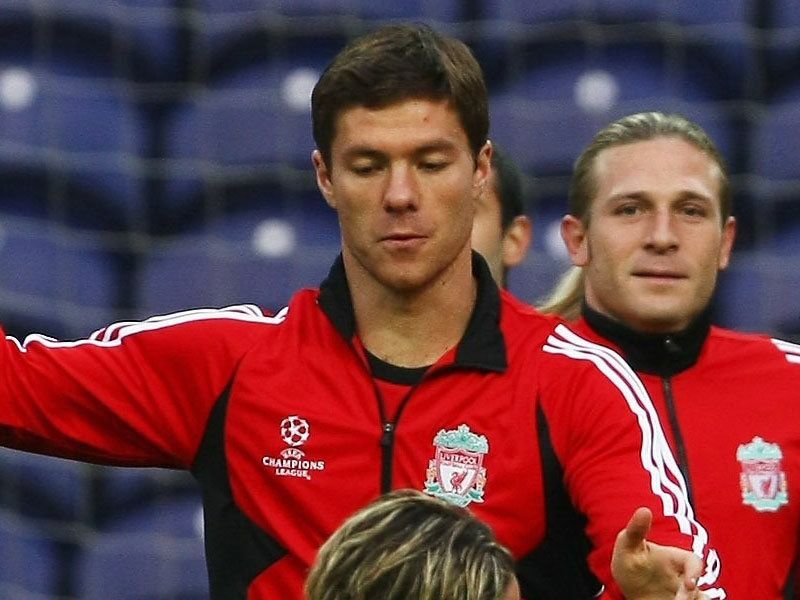 Xabi Alonso aims to be back in the Liverpool team 'as soon as possible' as he recovers from a foot injury. The Spanish midfielder has been ruled out for six weeks after breaking a metatarsal - an injury also suffered by team-mate Daniel Agger. Alonso feels Liverpool have been unlucky with injuries this season and is determined to make a swift return to Rafa Benitez's plans. "We have had a few injuries this season," Alonso told Sky Sports News. "Stevie (Gerrard) had his toe, Carra his rib, and Daniel and me had metatarsals. "It's always disappointing to be out of the team and not to be part of the training sessions and, of course, the games. "That's part of football and I will try to be ready as soon as possible." Meanwhile, Alonso outlined Liverpool's desire to be involved in the title race after successive 0-0 draws in the Premier League against Portsmouth and Birmingham. He added: "Hopefully, we won't miss those two points in the future. "We have a lot of priorities. The Champions League is a massive competition. We love that competition and each game, it's going to be a really important game for us. "Of course, the Premiership is something we really want to be challenging for." 0 Comments Published by KL Ocs Kid on at 3:32 PM. FERNANDO Torres’ absence from Liverpool’s starting line-up against Birmingham was a purely tactical decision, manager Rafa Benitez explained. The Anfield boss felt Torres’ lightning pace would be less of a threat against an impressive visiting defence which sat deep for 90 minutes. Benitez hoped strike pair Andriy Voronin and Dirk Kuyt would have the imagination to find their way through, but it turned into a nightmare afternoon for Liverpool’s attackers. The frustration was evident as Liverpool squandered two more precious points which now leaves them four behind leaders Arsenal. “You must be frustrated because you know before that you must win this kind of game,” he said. “You could see we were attacking, especially in the first half. “Clear chances are really difficult when the opponents play so deep. We had a lot of shots but they were off target. On Torres’ limited role, Benitez added: “We knew they would be deep and narrow and compact, so we needed the strikers to play between the lines. “Kuyt and Voronin can do this. After, when we needed fresh legs, we brought on Fernando, but you could see how many times he got behind defenders. Never. That's because there was no space. “I have four strikers and I need to use all of them. “How you pick your team is something you always have to think about, and both Voronin and Kuyt have game intelligence. 0 Comments Published by KL Ocs Kid on at 3:30 PM. 0 Comments Published by KL Ocs Kid on at 3:29 PM. In advance of our Carling Cup trip to Reading on Tuesday, YNWA looks back at the careers of some of those who have represented both the Royals and the reds. Most recent double agent Ray Houghton signed for Reading as a Player/Coach from Crystal Palace on a free transfer in July 1997. He made 56 appearances in his two seasons with the Royals before moving on to Stevenage Borough. He had signed for the reds from Oxford United for £825,000 in October 1987, and went on to strike 38 times in 202 reds games, helping us to two League titles and two FA Cups in his five years at Anfield. At the back Right-back Robert Done struck thirteen times in 155 reds games following his arrival from Runcorn in April 1926. He left for Reading for £150 in May 1935, but only played thirteen League games before moving on to Chester. Right-back Alf West scored six times in 141 reds games in two spells at Anfield prior to the First World War, first arriving from Barnsley St. Peter's in November 1903, helping us to our second ever League title in 1906. He joined Reading in 1909, becoming their club captain but he only stayed for a season before returning to Anfield. He only played five times in this second spell before joining Notts County in July 1911. Left-half Jim Bradley joined the reds from Stoke in September 1905 after 199 League games for the Potters. He nabbed eight goals in 185 reds games, including one appearance between the sticks, as he kept a clean sheet in a 3-0 defeat of Bolton Wanderers on Christmas Day 1909. He moved to Reading in the summer of 1911 having helped us to claim the League title in his first season with the reds. He then joined fellow Southern League side Stoke in April 1913. Centre-half Allenby Chilton signed for the reds as an amateur in summer 1938, before moving to Manchester United that November, without making a senior reds appearance. He turned out for the Royals during the war. Up front Scottish inside-forward Willie Fagan arrived from Preston North End in October 1937 and netted 57 goals in 185 reds games, helping to fire us to the League title in 1947 and the FA Cup Final three years later. Reading was one of many clubs he guested with during the war. He finally left Anfield in January 1952 to join Belfast Distillery. Ted Harston joined the reds for £3,000 from Mansfield Town in June 1937, and struck on his reds bow as we were thumped 6-1 at Chelsea that August. He bagged a brace in his second game but only played a further three games, and returned to amateur football with Ramsgate Town in 1939 after suffering a serious leg injury. He had previously represented the Royals, nabbing eleven goals in nineteen outings. Forward Jack Whitham signed from Sheffield Wednesday for £57,000 in April 1970. He suffered with injury and so could only make seventeen appearances, notching seven times. His finest hour in a red shirt came when he scored a hat-trick in a 3-2 defeat of Derby County at Anfield in December 1971. He joined Cardiff City in 1974 and spent the 1975/76 season at Elm Park, bagging three goals in nineteen League games, which all came in the one game against Hartlepool United, as they were promoted from the Fourth Division, before he returned to non-League football to join Worksop Town. Other double agents Messina Allman signed from Plymouth Argyle in 1908 and made his only reds appearance in March of the following year, as we lost 2-1 to Bristol City at Anfield in a top-flight encounter. Reading had been one of his previous clubs. 0 Comments Published by KL Ocs Kid on at 3:27 PM. 0 Comments Published by KL Ocs Kid on Monday, September 24, 2007 at 9:33 AM. Rafa Benitez were left to rue two home points dropped after his Liverpool side were held to a goalless draw at Anfield by Birmingham City. The stalemate came on the back of a 1-1 Champions League draw away to FC Porto and a 0-0 encounter with Portsmouth last time out in the league. Benitez said: "The game was very frustrating, we tried to play wide, we tried to get the ball into the box and we did everything we could to break them down. "In the end we ran out of ideas. The game was too narrow, it was too congested in the box and there was no space. "Credit to Birmingham, they were very well organised and worked very hard. They made it very difficult. "I suppose we must expect that style of play, but it is up to us to break it down, to find the spaces. "It would have been a different game if we had scored from one of our early chances, but as each minute went by the situation became more difficult for us." Benitez went on to defend his decision to leave record signing Fernando Torres out of the starting line-up, adding: "I have four strikers, I played them all in the end. "I felt that Andriy Voronin and Dirk Kuyt were the type of striker I would have needed to work hard against a packed defence." 0 Comments Published by KL Ocs Kid on at 9:32 AM. 0 Comments Published by KL Ocs Kid on at 9:28 AM. For the second week running the Arsenal striker appears in this feature, this time in recognition of his sensational hat-trick that led Arsenal to their 5 – 0 thrashing of Derby County on Saturday. The capacity crowd at Emirates Stadium was treated to another fantastic display of football by their side, who extend their winning streak in all competitions to six games, having scored at least three goals in the last five matches. Adebayor was a constant contributor throughout the match, not only in front of goal but providing crosses and working to win 50/50 balls. He opened his account on 25 minutes, when Cesc Fabregas sent a long ball over the top and the Derby defenders were too slow to react. Through on goal, Adebayor took two touches to round keeper Stephen Bywater and calmly slid the ball into the net. The Gunners extended their lead five minutes after the restart, as Adebayor fed the ball into the box for Eduardo, who was awarded a penalty when Matt Oakley was adjudged to have held him back. There was a sense of inevitability about the penalty, which the Togolese striker calmly side-footed to his right, and although Bywater could get a hand to it he couldn’t keep it out. Adebayor completed his hat-trick 11 minutes from time, when a lofted delivery from Denilson found him on the edge of the area. He expertly controlled with his chest, taking all of the pace off the pass and opening him up to move in on goal. The defenders closed down but he kept his cool, sliding the ball again toward the lower right corner, with Bywater getting a piece but yet again not enough to prevent the goal. Arsenal will not be too carried away by this predictably dominant performance over the Rams, but their recent string of flowing play and comprehensive victories could be enough to place them among the title contenders for the first time since 2004. Honorable mention here goes to Carlos Tevez, who took a step this afternoon to silencing his critics in Manchester. His scrappy, persistent play was a thorn in Chelsea’s side all afternoon, and the Argentine playmaker thoroughly deserved his goal. The Liverpool manager can be accused of being too conservative for the second straight Premiership game, as the Reds were held to a 0-0 draw at home to Birmingham on Saturday. Having to balance Euro 2008 qualifying and the Champions League Group Stage with the regular domestic fixtures, the Spanish manager chose to leave £26 million striker Fernando Torres on the bench, to be replaced by Andriy Voronin. This is the second match running that Voronin has started in place of the 23-year old Spanish international, and it seems to be no coincidence that Liverpool have failed to score in both of those fixtures. In contrast, the last match in which Torres started he grabbed two goals in a 6 – 0 win against Derby in the result of the season so far. Benitez did bring Torres on after 60 minutes, and Peter Crouch on for Voronin after 74, and Liverpool’s attack was noticeably energized. Torres showed his class toward the end with an audacious overhead kick that flew just over the bar. After a promising start to the season Liverpool lie in fourth place in the table, but after an unimpressive 1 – 1 draw to Porto in midweek, Benitez has failed to justify his tactic of giving his best goal scorer the weekend off. The referee for Manchester United’s 2 – 0 defeat of Chelsea made the headlines for all the wrong reasons on Sunday, having reduced the visiting Blues to ten men after only half an hour. Jon Obi Mikel, having shown too much of the ball to Patrice Evra, went in studs up on the French fullback, and Dean did not hesitate in producing red for the Nigerian midfielder. However, replays show that although the spikes were showing on Mikel’s right boot, his challenge seemed to stop short once Evra cleared, and that, despite the danger of the tackle, it was not malicious, but rather a genuine effort for the ball. Chelsea’s trips to Old Trafford will always be tight affairs, and on this day the visitors were unable to overcome the one-man deficit. And perhaps a cooler head by Mike Dean might have produced a yellow card, and a more evenly matched Premiership contest. Dean furthered Chelsea’s woes when he extended stoppage time in the first half by ninety seconds, giving the home side time to score what would prove to be the deciding goal. Then, in the 89th minute, Dean awarded a controversial penalty for a foul on Luis Saha, who made the most of a tame challenge by Tal Ben Haim. The French striker fired straight down the middle past Petr Cech’s flailing legs, and sealed victory for the Red Devils. Although none of his decisions were clear-cut howlers, it must be said that anytime a referee takes the game needlessly into his own hands (especially a match of this magnitude) it is a blow to the integrity of the Premier League and the sport itself. 0 Comments Published by KL Ocs Kid on at 9:26 AM. 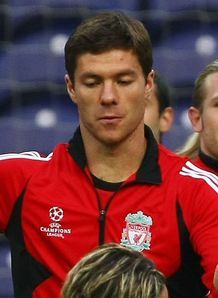 Liverpool star Xabi Alonso has admitted he is disappointed to see Pako Ayesteran leave the club. Ayesteran left the club earlier this month after a reported bust-up with Reds boss Rafa Benitez. Alonso, who is currently out of action with a foot injury, concedes it is big blow to everybody at the club to lose the former assistant manager. "I spoke to Pako when we knew he was not going to continue because we were very close. "It was difficult for all the players. We have been working so close to him for a long time. "It is a change and it has not been easy. We will have to see how it goes. "It will take a little bit of time to get used to the new situation because we were really close to him at all the training sessions. "Time will tell how it goes for us. We can't look back, we have to carry on our early form." 0 Comments Published by KL Ocs Kid on at 9:24 AM. 0 Comments Published by KL Ocs Kid on at 10:17 AM. Rafael Benitez has revealed he was planning to substitute Jermaine Pennant moments before his red card against Porto. The Liverpool winger saw red 13 minutes into the second half of the 1-1 UEFA Champions League Group A draw for a second bookable offence when he needlessly challenged full-back Fucile with the ball heading out of play. Lucho Gonzalez had given Porto an early lead from the penalty spot before Dirk Kuyt levelled with a close-range header as an out-of-sorts Reds side held on for a point. Pennant was cautioned in the first half for a challenge on Ricardo Quaresma and left referee Lubos Michel with little option but to produce a red after the interval. 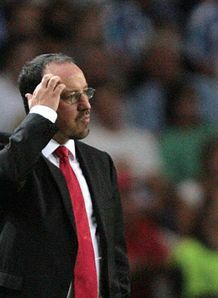 Benitez said: "I have no complaints about the decision. It was correct. "Hopefully Jermaine will learn from this experience. Maybe it will produce something positive for the future, the tackle in that position was just not needed. "It is difficult to understand why he did it, we had talked to him about staying on his feet and not making rash challenges. "We were even talking on the bench about taking him off, but we just did not get the time to do it." And the Anfield boss was at a loss to explain his side's dismal display in the opening 45 minutes. 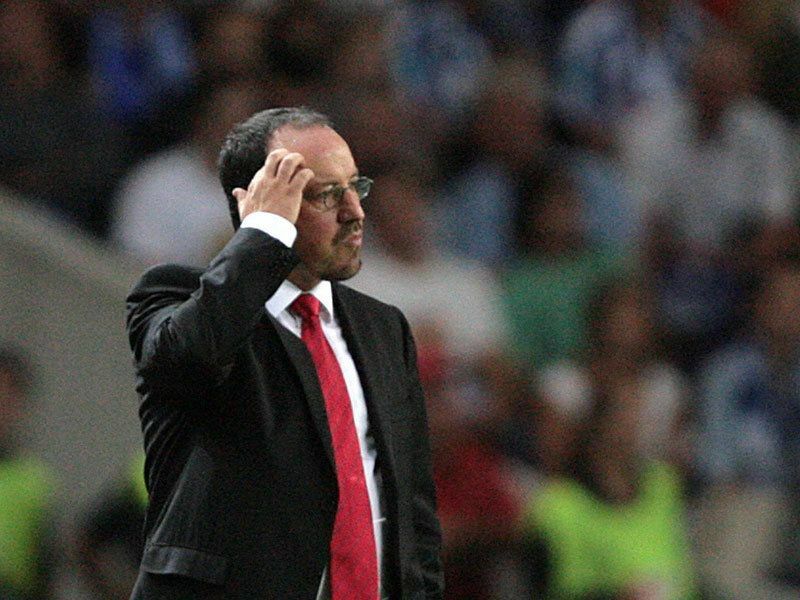 Benitez said: "We were really very bad in that first half, there are no excuses. "We started very, very badly and it is hard to explain why because our build-up and preparation had been good. "It was easier to do the right things in the second period, but the damage had been done. We gave the ball away far too easily, we conceded clear chances and gave away a penalty that was also a correct decision. "But the second half was much better. We needed to show real character and that is what we achieved. "We were more organised, there was an excellent work rate and there were positives to be drawn from the second-half performance. "We were playing against a good side and we have no complaints about the result." 0 Comments Published by KL Ocs Kid on at 10:14 AM.